The time has come to finally announce that Rogue Legacy is out for the Xbox One! Currently this is the last major platform we’re planning to release the game on, which means we can finally kick back, relax, and spend 18 hours a day fully focused on working on our next project. Look forward to updates in the upcoming months! 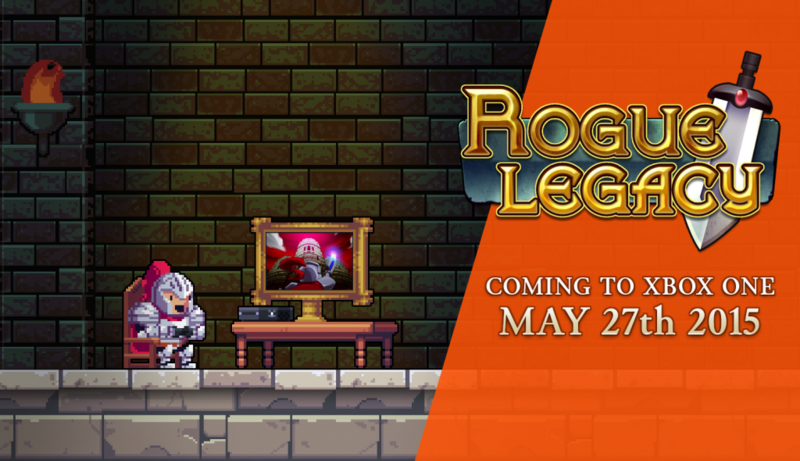 So Rogue Legacy is finally making its way to the Xbox One, and we’re super excited to be bringing it to you guys! It’s been a long time coming, but we did our best to ensure the experience was as faithful to the original as possible. We worked closely with Abstraction Games and now we’re finally able to extend our legacy to fans on the Xbox One. The game will be available on Microsoft’s console on May 27, 2015, and we hope Xbox fans who have yet to try the game get a kick out of it. We’ve got an official post on the ID@Xbox blog if you want to check it out! DISCLAIMER: I copied the first sentence of this post straight from the blog.